[Madison, Wisc…] Homeowners in 148 school districts across Wisconsin will be getting an unexpected tax cut next year, but many of those districts would prefer to keep that a secret – and backfill those savings with new spending. “What’s creating that shelf? Well, we’re backing out the energy efficiency exemption for $1.5 million. That’s the first thing. The second thing is state aid is projected to go up. Remember if state aid goes up, revenue limit, tax levy goes down. So that’s what’s creating this opportunity right here. This opportunity has been exercised to leverage the facility’s end,” Wehner explained to the school board in June. Edgerton’s referendums would have an actual tax impact of $3.28 per thousand dollars of home value. 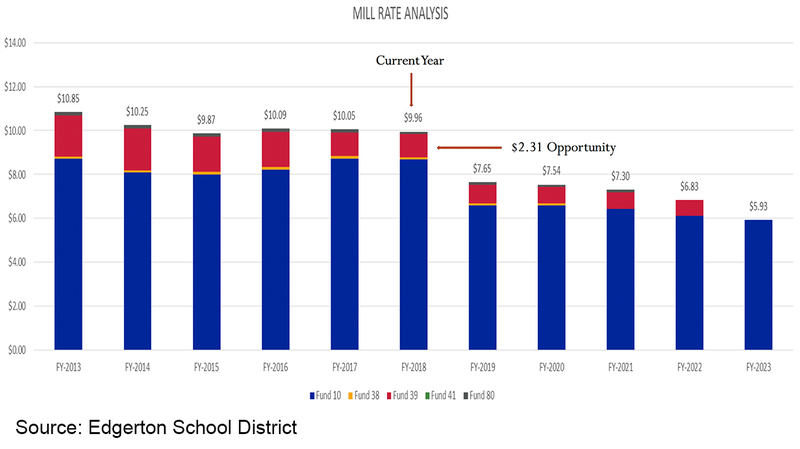 Using the “levy opportunity” the district claims the referendums will only increase taxes $0.98, while ignoring the $2.30 tax cut if they fail. 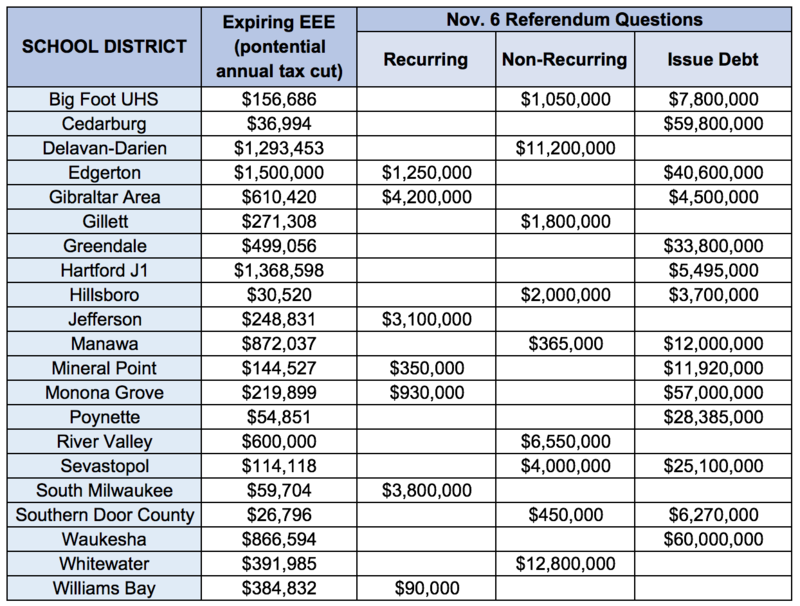 While districts are currently using the EEE to sell voters on expensive referendums, it’s questionable what the EEE funds went toward in the first place. Over the past four years, the Waukesha School District collected an extra $4.6 million for energy efficiency projects. Yet now the district is trying to pass a $60 million referendum to replace windows at all its schools, and upgrade/expand the HVAC systems at 4 schools. Last year Edgerton poured a million dollars from the EEE into the high school’s HVAC system, according to documents obtained by MacIver News Service in an open records request. The referendum is now needed, in part, to address “air conditioning in all spaces” at the school. Throughout the state, there are a total of 61 districts going to referendum next month. The combined cost is $1.25 billion for construction, $157 million for one-time operations, and $26 million in permanent annual operations spending. Not all of those districts have the EEE “opportunity levy” to exploit, but there are other ways to create the same illusion of little to no tax impact. Some districts, like Watertown, are using debt retirement from previous referendums to create their “levy opportunity.” If voters there approve the $16.6 million referendum, the district promises it “will result in a zero increase in the school portion of property taxes over the current level for our community taxpayers.” That current tax rate is $8.98. If the referendum fails, it will drop to below $8.00 – a tax cut of over 10 percent. Watertown’s current tax rate is $8.98. If their $16.6 million referendum fails, it will drop to below $8.00 – a tax cut of over 10 percent. It’s the same story in the Burlington Area School District, which is going to referendum for $43.655 million. It’s retiring debt from its 1997 and 2004 referendums next year that would result in a $0.42 tax rate decrease. And so, the $0.75 tax impact from the referendum is spun as a mere $0.33 increase. Over the past several years, the number and amount of referendums during the fall general election has been increasing. This year there are 82 separate questions with a stated value of $1.4 billion. In 2016, it was 67 questions at $1.3 billion. In 2014, it was 53 questions worth $697.6 million. From the tactics and literature accompanying this year’s referendums, it appears the harder the state works to provide property tax relief, the harder local school officials will work to keep local taxpayers from ever benefiting from it.